Samsung's launch of the Galaxy Note8 smartphone underlines its current confidence. Back in October 2016, following the second recall of the ill-fated Note7 device, there were plenty of commentators who were happy to join in with the near-hysterical reporting of Samsung's misfortunes. At the time, CCS Insight took a more pragmatic approach and predicted that Samsung would recover its reputation, but we were sceptical that it would be able to resurrect the Note brand (see Samsung Will Recover from Note7 Woes). It's a testament to Samsung's tenacity and determination that the launch of the Note8 cements its position as the leading Android smartphone maker, drawing a clear line under the Note7 problems. The new smartphone joins the well-received Galaxy S8 and S8+ handsets, arguably giving Samsung the best high-tier Android line-up of any manufacturer. By launching it now, Samsung gets the oxygen of publicity ahead of Apple's highly anticipated iPhone 8. Samsung will be hoping that a trio of competitive high-end products will appeal to anyone looking for a new Android phone. These devices are certainly good enough to turn the heads of a few iPhone users who fancy trying a different handset. The fact that Samsung was prepared to continue using the Note brand shows its belief that there's significant pent-up demand for another top-of-the-line flagship device alongside the rest of its smartphone portfolio. 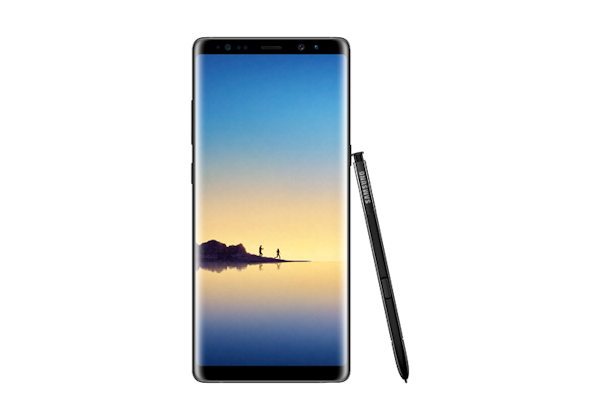 Our channel checks also suggest that there's demand for the Note8 from a loyal group of customers who love big screens and the utility of the stylus. It's striking how many long-term Note users who were unable to get the Note7 (or had to return it) have been holding out for this latest update. Based on our brief hands-on experience with the device, it seems clear that the Note8 bakes in further refinements building on the success of previous Note phones. It's easier than ever to use the stylus and, in keeping with its name, note-taking is a breeze. Arguably, the biggest bet on this device is the camera. This is the first time Samsung has integrated a dual-camera configuration on the rear, something that other phone makers, most notably Apple, have supported for some time. Having image stabilisation on both lenses takes Samsung one step ahead of its rival, but at present it seems there aren't any plans to support augmented reality capabilities — something we expect to feature prominently on the next iPhone. Ultimately, the Note8 isn't a game-changing device, but that's almost unheard of these days as smartphone makers desperately struggle to differentiate their handsets from rivals. However, the Note8 does demonstrate to rival manufacturers what a fearsome competitor Samsung is. It offers a smartphone with a stylus-centric twist that will act as a "halo" device to Samsung's already strong portfolio. By maintaining the Note brand, the company is sticking with a tried-and-tested formula, despite the challenges it faced with the Note7. In so doing, Samsung is using its product and marketing strengths to relegate the Note7 episode to a footnote. This is a shrewd move. Had Samsung simply retired the Note brand, it's likely that it would have had a greater, far more negative legacy.